"The 30% Iron Chef" is the fifty-fourth episode of Futurama, the twenty-second and last of the third production season and the eleventh of the fourth broadcast season. It aired on 14 April, 2002, on Fox. Bender's dream of becoming a chef seems to have ended when Elzar refuses to teach him, but on Bumbase Alpha, he meets a man who may have the secret he needs to be a great chef. 1.1 Act I: "But this food actually tastes better as vomit!" 1.2 Act II: "That jerk Elzar ruined my dream of being a chef too." 1.3 Act III: "Also, it comes with double prize money." Act I: "But this food actually tastes better as vomit!" Bender is watching Good Morning Earth with Morbo and Linda, Morbo hosts a segment with Bender's idol, the famous chef Elzar. Following Elzar’s instructions, Bender is cooking brunch in his usual, inedible style. Fry learns that Bender is cooking and leaves to warn/tell the others. Meanwhile, the Professor is showing off a scale model of the world's largest bottle. Fry warns the rest of the crew about Bender’s cooking and they attempt to run away, only to have Bender intercept them. While the rest of the crew try to avoid eating Bender's cooking without hurting his feelings, Zoidberg stays behind and accidentally breaks the bottle. As Bender is returning to serve up glasses of mop-squeezings, he overhears Fry and Leela talking about how bad his cooking is. This makes him upset, and he leaves a note and runs away. Act II: "That jerk Elzar ruined my dream of being a chef too." Bender tries to convince Elzar to teach him to cook, but Elzar refuses. Miserable, he ends up meeting some hobos and joins them in hopping a train to the biggest hobo jungle in the quadrant, Bumbase Alpha, located on a remote asteroid. Meanwhile, Back at Planet Express, Zoidberg, after failing to fix the model, concocts a plan to frame Fry for breaking it. At Bumbase Alpha he meets Helmut Spargle, the chef who used to be the host of a TV show and had once trained Elzar to cook. Spargle agrees to teach Bender to cook in order to get revenge on Elzar, who he blames for ending his career. In his final test, Bender serves Spargle a meal -- which kills him. Before he dies, he passes on the secret of perfect flavor, in the form of a diamond vial containing the essence of pure flavor. Bender vows to avenge his late teacher by defeating Elzar. Back at Planet Express Headquarters, the Professor discovers the broken bottle and Zoidberg's fake clues pointing to Fry. Though he doesn't remember committing the crime, Fry shrugs and pays the Professor $10 to replace the bottle. Zoidberg begins to feel guilty for framing his friend. Act III: "Also, it comes with double prize money." 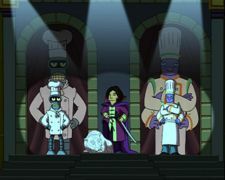 Bender confronts Elzar and challenges him to a cook-off. They compete on the TV program Iron Cook, where their secret ingredient was Soylent Green. Elzar produces a variety of eye-pleasing dishes, including a salad garnished with $100 bills. Although Bender's food looks awful, the judges declare that it tastes better and make him the winner. Bender gives a stirring speech, after which Zoidberg charges the stage to confess for framing Fry. Since he cannot repay the money, he attempts to kill himself by committing seppuku, but ends up merely breaking a $5,000 sword on his shell. Back at Planet Express, after watching the episode of Iron Cook on TV, the Professor tests Bender's vial of "pure flavor" and determines it to be ordinary water - laced with a few spoonfuls of LSD. Bender offers to cook the crew food laced with the water and they eagerly accept. We learn in this episode that Bender has 8 senses, which do not include taste but do include an unexplained sense, "Schmision." Hermes' meal is not distinguishable. "Helmut Spargle" is a German-based name; "Helmut(t)" is a traditional German male name. The chef's surname, "Spargle", comes from the German word "Spargel", which means "asparagus" (although the initial "s" is pronounced with a "sh" sound, so the word is pronounced like "shpargle"). Asparagus is commonly grown in Germany, and is one of the most popular vegetables there. At the beginning of Act 3, Horrible Gelatinous Blob was seen in a hovercar. Morbo: Pathetic humans, prepare to write down the recipe!!! Hobo: We're going nearly the speed of light so, uh, roll when you land. Bender: That is why I decline the title of Iron Cook, and accept only the lesser title of Zinc Saucier, which I just made up. Also, it comes with double prize money. Martha Stewart's Head: I'm swimming in my own soylent waste. It's a good thing! Bender: Master Spargle, if you can hear me up there in that ditch where I left you, this is for you! Fry: Man, I don't wanna hurt Bender's feelings but this food actually tastes better as vomit! Leela: It's unbearable! How much do you think it would cost to have my tongue removed? The montage showing Helmut Spargle teaching Bender to cook includes several references. The music playing is from a training montage in The Karate Kid. Bender peeling a hover-potato with an energy blade is a modeled after a scene from Star Wars Episode IV: A New Hope, when Obi-Wan Kenobi was teaching Luke Skywalker to feel The Force and use a lightsaber using a training device. Also Spargel’s character and subsequent death are a parody of Yoda. He also mentions the "Dark side of cooking". Bender accidentally chops up his arm along with a cucumber, and Spargle demonstrates that the blade is still sharp enough to slice through a tomato without crushing it - a reference to commercials for Ginsu knives. Soylent Green is a reference to the cult-classic sci-fi movie by the same name. The space train has cars bearing labels, all references to real railroad companies. "Baltimore & Orion" is a reference to Baltimore and Ohio Railroad. "Starlight Express" is a reference to the Andrew Lloyd Webber train-themed musical Starlight Express. "Wrath-of-Conrail" is a combination of Conrail and the second Star Trek film The Wrath of Khan. Koji's line "Domo arigato, Mr. Roboto" is a reference to the song Mr. Roboto by the band Styx. The show "Good Morning Earth" is a reference to the long-running ABC morning show Good Morning America. The prism track splitter on the space rail track near Bumbase Alpha may be a reference to the cover for the Pink Floyd album The Dark Side of the Moon. The thousand year galactic war brought to an end by Martha Stewart's "Apple Dandies" (secret ingredient - pork) was possibly a reference to the conflict in Palestine, the warring parties of which refuse to eat pork for religious reasons. The episode ends with a few bars of the Cream song "Sunshine of your Love". Objects placed downwards into the table wormhole reappear at the top of the screen. This may be a reference to the theory that the Universe is toroidal (doughnut-shaped). It may also be a reference to wraparound gameplay in early video games, such as Pac-Man and Asteroids, that allows characters and objects to move off the side of the screen and reappear on the opposite side. When Zoidberg sneaks into the bathroom to plant fake evidence, Fry is singing "Walking on Sunshine," the same song he had sung in the showers on Spheron 1 while scrubbing Kif during the episode "War Is the H-Word". When the crew (except Bender) try to escape, Fry claims Bender is blocking the only escape route, even though there's another one behind them -- which leads directly to the ship. In fact, as sometimes occurs whenever required by the script, the layout of the second floor of the Planet Express building is changed considerably. The Kitchenette is normally just off the Conference Table area, with no partition between them. In this episode however, it is a four-walled room, rotated 180 degrees around its original axis, and is now connected by swinging-door directly to the Employee Lounge. This would also mean that the Employee Lounge is no longer connected to the Conference Room. At the end of the episode, the swinging door has disappeared from the Employee Lounge, replaced by the regular sliding door that normally leads to the Conference Room. A few shots of the judges' table shows Hiroki to Tate's right, but he, and some of the table's length, disappears before the judging. The spectrum that emerges from the prism is oriented along the wrong axis. This is acknowledged in the commentary. A potato weighing -5 pounds would react to gravity in a manner opposite a 5 pound potato and would fall upwards to the ceiling. The writing utensil that comes out of Bender's finger when he writes his "Plea for Attention from Bender" looks like a fountain pen, yet when he checks off the boxes on the paper, it produces a rubbery squeak like a marker might. Fountain pens produce scratching sounds. In the Comedy Central broadcast of the episode, Bender's eyes are white, instead of their standard yellow tint. Location: Logo for show "Iron Cook"
This page was last edited on 14 February 2017, at 04:29.